Happy President's Day! 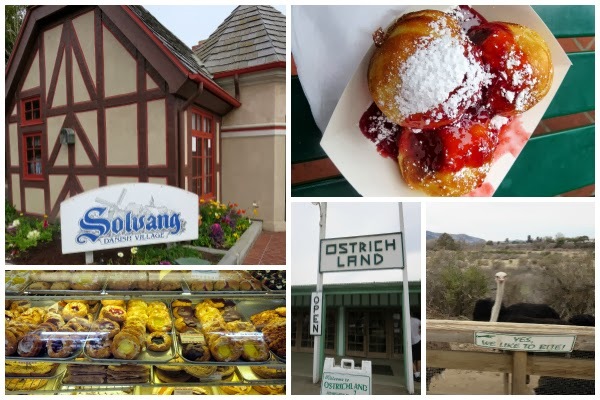 I have the day off and the house mostly to myself, so I've been celebrating the long weekend by working my way through my list of fun things to do alone, including a mini road trip to Solvang! I bought a Groupon and pampered myself with a mani/pedi at the lovely Chiffon Boutique, ate Dutch pancakes at Paula's Pancake House (at the counter, thanks to Courtney of Eat Pray Run DC's advice), sampled way too many of Arnie's Famous Aebleskiver, and visited the infamous Ostrich Land of Sideways fame, all by myself. While it was a little awkward to be flying solo at times (Ostrich Land was full of families, didn't do any wine tastings because they were full of couples) I have to say I really enjoyed the alone time! In addition to my mini road trip, I also used to extra time off to meal prep up a storm. And to procrastinate actually writing this post, so it's up a little later than usual. Oops. Sorry about that! Even though we've been having 70 degree weather, I still had a big baking urge. Plus I picked up these amazing organic Pink Lady apples, so I decided to put them to good use in a yummy new baked oatmeal recipe. Mix all ingredients (including only half of the almonds) in a large rectangular microwave and oven safe baking dish. Sprinkle the rest of the almonds over the oatmeal mixture. Bake for 15 minutes or until mixture is firm. Broil for the last minute or until the almonds are golden brown. Mash sweet potato, lentils, avocado and egg whites together until well combined. Add in chia seeds, garlic, salt and pepper. Form into twenty balls, then roll each ball in flax meal. Place balls onto a greased baking sheet. Bake for 30 minutes or until balls form a golden brown crust, turning over once. The balls have a nice nutty flavor from the flax meal and are slightly sweet from the avocado, but are pretty neutral. They'd go equally well with salsa, tzatziki sauce, curry sauce, or any number of flavors. I took a trip to Tri-County Produce for the first time on Sunday and was blown away by the selection of super fresh and high quality produce at reasonable prices. I picked up a pile of fresh produce, including some great looking lettuce, peppers, snap peas, apples and pears. 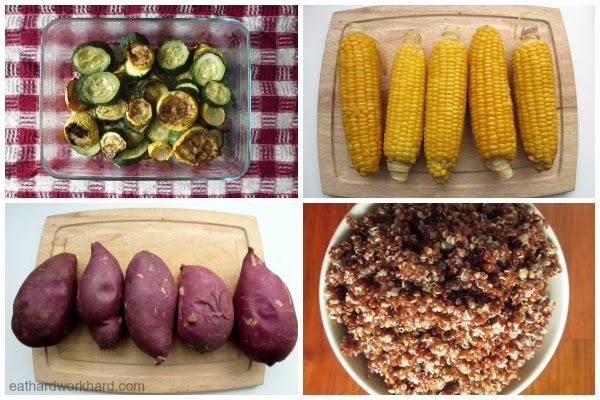 I'll eat most of it raw, but I roasted the zucchini and squash as usual, boiled corn, baked these cool sweet potatoes with a purple skin, and cooked up some quinoa for this week's hot sides. My main goal is to get on the track for a speed workout this week, hopefully tomorrow! Q: How was your weekend? Do anything fun, solo or otherwise? This is going to be my breakfast for the week next week! Looks delicious! The Peanut Butter Apple Oatmeal looks amazing! I can't believe it's already Wednesday as the weekend seems so far away, but I ran my first local race on Sunday. It was only a 7K, but the runners in Barbados are no joke…they're super fast! So it was harder for me than I thought it would be, but the celebration after (beer, of course) was well worth it! I hope you got all your workouts in and are having a great week!